The Pagoda Tree is a handsome shade or street tree, with good shape and compound leaves that cast a light shadow. It is tolerant of urban conditions, does well in summer heat, and withstands drought once it is established. Lovely in bloom, the Pagoda Tree flowers for a long time in July and August--large panicles of fragrant, creamy-white blossoms. These are followed by interesting pods of bright yellow. Sophora will grow in lawns or at dry edges of a landscape. 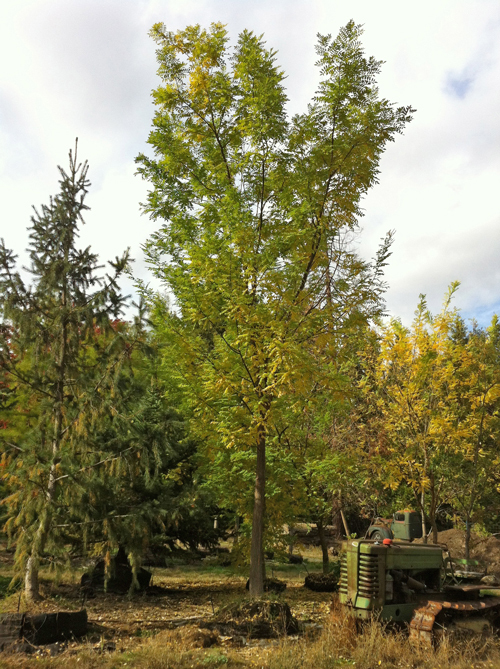 This spreading, round-headed deciduous tree grows at a medium fast rate to 30-40ft or more, with an equal spread. Abundant, creamy-white to yellow, pea-like flowers in long, 12inches, panicles bloom over several weeks in late summer. Deep green and lustrous leaves are compound, 6-10inches long, and composed of 7-15 leaflets. They hold their green color late into fall, then turn yellow. Plant in sun or partial shade, in loamy, well-drained soil. Once established, it is fairly drought tolerant.